American wines can be separated into two categories: those which are produced in California and those which are not. The California product is a step-child of the European one. It resembles the step-parent in both type and taste, and is actually made from European wine-grape varieties. The non-California product is made primarily from native America grape varieties belonging to the species Vitis labrusca, and resembles most Old-World wines very little. Among the non-California producers, New York State is far and away the largest and most important. Its wines are drunk twice as often as imported wines, and its champagnes vie with those of California for market leadership in this country. Despite the statistics, New York wines remain among the least appreciated of all wines that are consumed by Americans. One reason for this is that New York producers have established their reputations, by and large, by their “champagnes.” Their table wines, being in the inexpensive, ordinary category, have hardly been in the the position to acquire the kind of reputation some California producers have gained for their own wines,. Too many of the Eastern wines, while sound enough, are either sweetened, pasteurized, or even mixed with cheap California wines to get rid of the s0-called “foxy” taste so many wine drinkers find disagreeable. There are quality table wines from New York State. Not being produced in the quantities of the Western state’s vineyards, they are relatively scarce and not very well known. Most of them are made from recently planted hybrids developed by oenologists such as Louis Seibel of France. These vines — producing the new varietals such as Chelois, Baco Noir, Aurora, and Dutchess — can suit anyone’s palate. The reds are distinctly flavored, sound, and good meal accompaniments. The whites are soft, fruity, and well-balanced — not too sweet, and obviously unsugared. They are inexpensive as well, rarely costing more than $2.00. A memento of my visit to the Pleasant Valley Wine Company. I am in the center, next to Richard Vine, manager, at right. 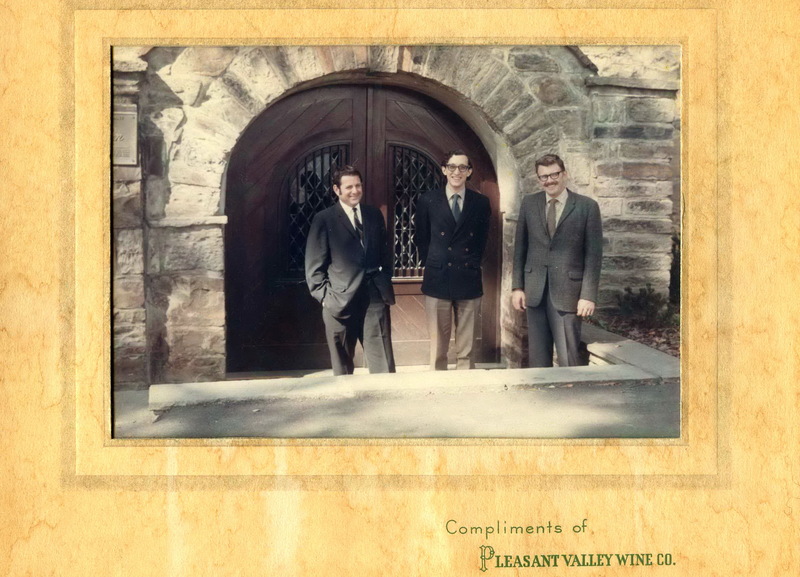 [Pleasant Valley Wine Co., aka Great Western Winery (established in 1860 and Bonded Winery #1–the first in the United States.)] is the largest and most important of the producers of these wines at present. Smaller firms like High Tor Vineyards on the Hudson and Boordy Vineyards on Lake Erie produce interesting wines for less than $2.50 a bottle. Bully Hill’s red and white wines come from the same district [Finger Lakes] as Great Western, but they cost nearly twice as much. One producer in the Finger Lakes region had the courage to plant pure vinifera strains such as the Pinot Chardonnay, Riesling, and Traminer, and makes really fine wines which you can try if you are willing to pay the price. Dr. C. Frank’s pioneering efforts under the aegis of Gold Seal Winery has even brought us a remarkable instance of a vintage Riesling Trockenbeerenauslese for $45 a fifth. Don’t try to find one for hardly any exist. But $4.50 will buy you his fine Spätlese. More New York varietal wines will be produced and made available to us. It is simply a question of time, and of making the producers see that the demand is there. Eventually, one will not have to be a reverse wine snob in order to drink any New York wine. This entry was posted in Vineyards, Viticulture, Wineries and tagged Abel Magazine, Aurora grape, Baco Noir, Bully Hill Winery, Chelois, Constantine Frank, Finger Lakes wines, Gold Seal Winery, Great Western, High Tor Winery, Louis Seibel, New York Wine, Pinot Chardonnay, Pleasant Valley Wine Company, Trokenbeerenauslese on 15 June 2013 by JoseM-L.